It was 1st November 2007, and I’d set myself a ridiculous challenge. By the end of the month, I would have written a novel, from start to finish. It would be a road novel for 21st-century Britain, a forlorn but determined attempt to live authentically and spontaneously in a highly controlled society. As I stared at the blank screen, planning things out and calculating just how many thousands of words I would need to write each day, I came to an important realisation. Before I could begin typing, I would need new music. Before then, you see, I’d been a devotee of calm, soothing, contemplative music. I’d always started my writing day by lighting an incense stick and playing George Winston. Beautiful, aren’t they, those dreamy piano notes? A perfect soundtrack for a morning spent gazing at swirling incense smoke and waiting for inspiration. Unfortunately, not a good way to get a novel written in a month, certainly not a novel of frustrated youth raging against the stunted future mapped out for them. Poor George would have to go. I first met Neil not long after my father died. Not much, but it was a start, and soon I was describing Neil, and the words started to flow, and I followed it up with Reef and Jimi Hendrix and burningpilot and Supergrass and I saw my characters, Jack and Neil, rampaging up and down the Holloway Road on a cold November night. I kept writing as they ran the life of drinking and parties swiftly to its conclusion, and after a week or so I was already five chapters in, and Jack and Neil had ditched London and made it to John O’Groats and were paddling in the freezing North Sea at three in the morning to the accompaniment of the suitably weird Alien Ant Farm. By this time a change was called for, both for me and my characters. The frenetic pace couldn’t last. I took to walking a few miles every morning, and completed the bulk of the book sitting in a now-defunct north London cafe all afternoon for a couple of weeks with the likes of Bob Dylan and Stereophonics on my iPod. The quieter mood suited my characters, who were getting worn down by their quest but kept going anyway, taking one more step, visiting one more town, drinking, like me and Dylan, just one more cup of coffee. They went forward not with the hopeful enthusiasm of earlier; they went forward simply because they couldn’t go back. For the ending I wanted something quiet and poignant, almost an anti-ending after all the noise and fury of earlier on. It was 30th November and I was tired, and so were Jack and Neil, and the three of us gritted our teeth and limped to the finish line with the dying chords of Wish You Were Here reverberating in our ears. I took a week or two off from writing, printed off my manuscript and was amazed to discover it was ten times better than the novel I’d spent years working on before that. It would go on to win an award for unpublished writers, netting me £2,500 and a publishing deal, and my life would change. Of course, that was still in the future. Before all that happened, I still had to edit the novel. That’s where George Winston and the trusty old incense stick came in handy again. 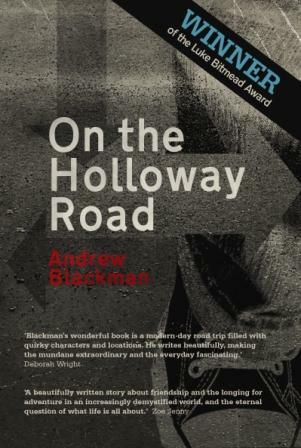 Andrew Blackman is the author of the novel On the Holloway Road (Legend Press, 2009), which won the Luke Bitmead Writer’s Bursary and was shortlisted for the Dundee International Book Prize. 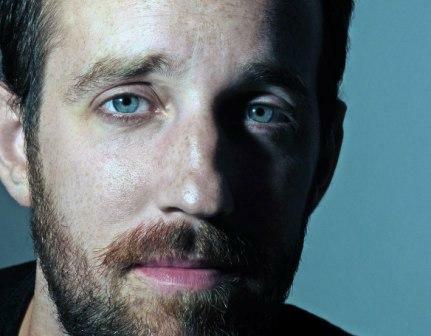 His next novel, A Virtual Love, deals with identity in the age of social networking, and is out in spring 2013. He’s a former Wall Street Journal staff writer, now converted to fiction. More information available at his website, or you can connect with him via Twitter. This entry was posted on April 17, 2012, 9:41 pm and is filed under Undercover Soundtrack. You can follow any responses to this entry through RSS 2.0. You can leave a response, or trackback from your own site. I love the way you describe your musical journey here. I can never write while someone else is singing, though. The lyrics work their way into my head and get tangled up with the words I’m typing. But the choices you made do give a real insight into the sort of novel you wrote – I can feel your style, almost, through imagining the character of the songs. Glad you enjoyed the post, Litlove. I love this way of getting behind the scenes of an author’s book. Since I started the series I’ve discovered some cracking reads. Come back often! Hi litlove, I’m normally the same – as much as I diss poor old George Winston in this post, I usually write to that kind of music. Or classical music – Bach, Chopin and Schubert work well for me, or Beethoven for more energy. The more contemporary soundtrack was a particular choice for this novel, but not one I’ve repeated much since then. Thanks for the comment, and I’m glad you liked the post! Andrew, I love this! I felt like I was running along with Jack and Neil and the music was pulling at me. I can write listening to lyrics if the music is a perfect match to the story. Right now it’s music from Woodstock for my series set in ’69-’71. Hi Roz! Thanks for hosting Andrew! Hi Marcia! Glad you enjoyed Andrew’s post. That’s interesting what you say about the lyrics – when I use music, I sometimes find the lyrics match but usually if the emotion does it, that’s enough for me. And often I can’t distinguish the lyrics anyway. Hi Marcia, thanks for the lovely comment! I’m glad you felt that way. I find music inspirational because it appeals directly to the senses, and if I can channel some of that into my writing then I’m happy and grateful. That soundtrack sounds perfect for your series. Do you have any particular favourites? Are you more Joan Baez or Grateful Dead? Fascinating, Andrew, especially since I’ve read the book. I heard the Dylan, remember, I entitled my review Hollow Highways Revisited. I love Heroin by The Velvet Underground and I think your Ipod and mine have a lot in common. PS: Do you “hear” music when you read? when the author has a strong voice, sometimes his/her words brings songs to my mind. Emma, Andrew just emailed me in distress and I’m very sorry you ended u in the spam folder. Thanks for visiting my blog and taking the time to comment and I hope I have now educated WordPress to give you a proper welcome. Hi Emma, I guess that says a lot about the influence of music, if you heard the music that I was listening to as I wrote it. Well, some of it, anyway! It’s wonderful to think of you hearing the same music that I was listening to when I wrote it. Do I “hear” music when I read? Kind of. I don’t often find that a song actually pops into my head while I read, but I do find that some books put me in the mood to listen to a certain song either while reading or right after. Reading Alex Wheatle’s East of Acre Lane, for example, made me want to put on some good reggae! Incidentally, I was at the launch for his latest novel and he was giving away copies of a soundtrack he’d put together to go with the novel. Maybe you should have him on here, Roz!